Hungary's Welsh fly-half Gareth Lloyd helped them overcome Bulgaria in Europe's opening 2015 Rugby World Cup qualifier. Lloyd dropped a long-range goal in Kecskemet as Hungary saw off the visitors 28-23. 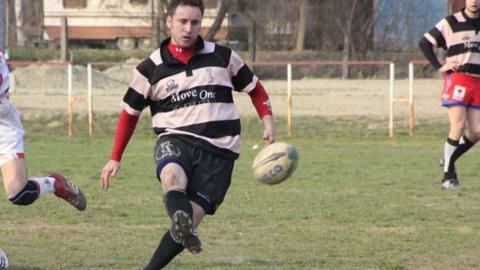 The former Machen player, now of Budapest Exiles RFC, hopes Hungary can progress further in qualification. "We'll give it a go - it's a long way to. It is a tough task but we are up to the challenge," he told BBC Wales. Lloyd settled in the eastern European country in 2002 after he married a Hungarian he met on a rugby tour. "Before I made my way out here [to Hungary] I made sure that I contacted the local rugby team and they accepted me into the club and it's taken off ever since." The Budapest Exiles team is made up of a number of nationalities including Italian, French, Irish and American. Lloyd, who is from Caerphilly, was approached to play for Hungary after impressing for the Exiles. "There's not a lot of teams in Hungary. When they asked me I just jumped at the chance of getting an international cap," he added. Hungary faced Bulgaria in a European Nations Cup Division 2C encounter that doubled as a World Cup qualifier.